I forgot to mention that if you are not a PayPal fan you can snail mail a check with your payment, your shipping address, and your email address to: Linda Farmer, PO Box 31146, Palm Beach Gardens FL 33420. Please remember to add the correct shipping cost to your total. THANKS! Where is the link to order both the mandala set and the official kit? 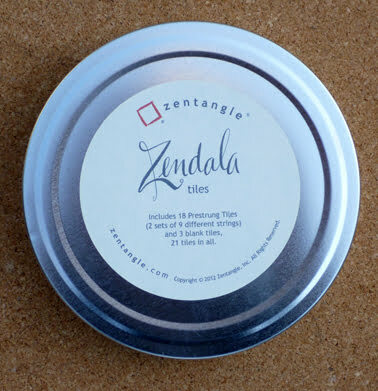 Hi Barbara, there isn’t one yet – I’m working on adding a Shopping Cart to the TanglePatterns Store right now – in the meantime, please use the individual buttons for the Kit and the Zendala Set and place separate orders, then I’ll refund the Zendala shipping. Thanks! Thanks a lot, Linda. I will do that! Will there be more blank mandala tiles to be able to purchase? I have just placed the two orders. Can’t wait til they come. As I live in the UK and really do not want the tin, do you sell just the download of the patterns of the Zendala set? Hi Sarah, the short answer is no, the set comes in the tin which protects the tiles. I love the sepia color in these zendalas..what kind of pen and where can i get it? Hi Laura, these are also Sakura Microns and you can find them here on Amazon. What pen do you use with black tiles? Is this size of title same size as CD? Pretty much but not exactly.